Fish Hunter is now available from Highway Entertainment as both a complete machine as well as a software kit. The goods are in stock and will ship from Taiwan. Fish Hunter is a ticket redemption game where players shoot fishing nets in an attempt to catch as many fish as possible. Each fish that is caught earns the players points, which in turn leads to a higher coin/ticket payout. The joystick controls the direction of the gun tube, while the 'Weapon Change' button alters the size of the fishing nets and type of gun tube used. Each tube has varying levels of power. Throughout the game, there are four different mini games that will start at random intervals. 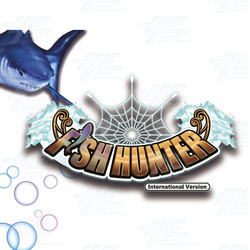 These mini games include Deep Bomb (a deep water bomb will be awarded randomly, allowing players to catch all fish currently in the fishing ground), Lucky Wheel (a spinning wheel will show up on screen and a points reward of 10 to 99 will be awarded according to where the wheel stops), Fishing Task (players are given an assignment where they must catch a certain number of fish before time expires) and Golden Fish (players a given a searchlight that they can use to look for hidden golden fish that will give them 300 - 1000 points if caught). There are a total of twelve different fish in the game, with each species having a different points value.